But what do we know, if anything, about how she imagined them to sound? 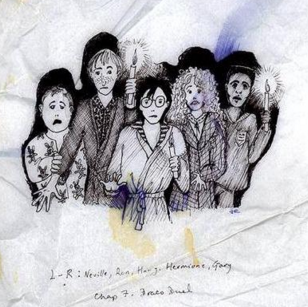 What canon info is there on the voices of the major characters in the Harry Potter series? JKR: Do Dumble-, er - not Dumbledore - Hagrid! Lydon: And how about Minerva McGonagall? JKR: Very clipped, and very, very - quite upper-class and very brisk - like a governess [Lydon laughs] I - I - I can't do it, but I kind of see Dumbledore more as a John Gielgud type, you know, quite elderly and - and quite stately. JKR: I suppose he sounds like me. I always do my voice for Harry, when I'm reading to my daughter. The audio of this section of the interview, including a minute or two of JKR reading aloud from her own book, is available here (Internet Archive; sadly the original link has gone dead). Has J.K. Rowling ever explained the rules of the 'special effects' (bangs, flashes/jets of light, puffs of smoke) of magic? What's the relationship of Harry Potter Trading Card Game to J. K. Rowling?